If you need to reset the device you run the POS on and sign in, for example, to a different account tap on the settings cogwheel at the top of the POS screen. At the bottom of the screen is a red button to reset your device. 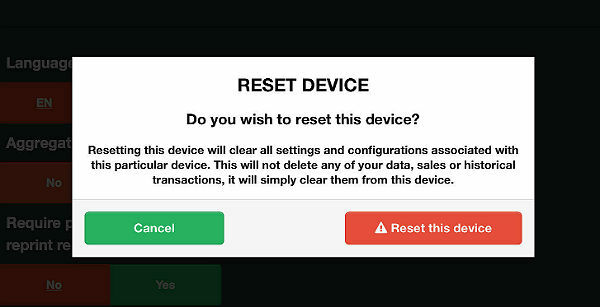 The ‘Reset’ button provides you with the ability to reset your current device safely from AirPOS. To do this simply click ‘reset device’ and the following modal window will give you the option to do so.